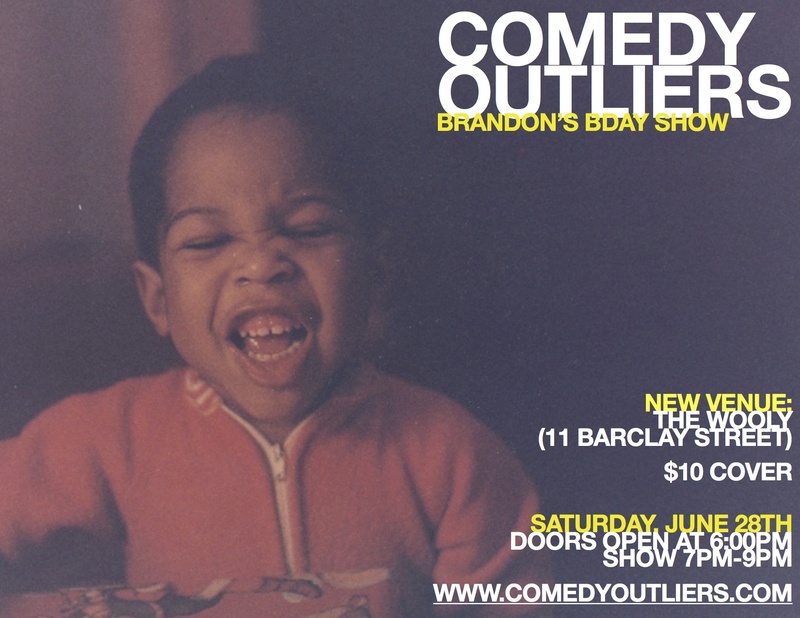 Comedy Outliers: A Million Ways to Deal With Venue Changes! Guest post by Brandon Collins and Mike Brown of Comedy Outliers. They offer advice to comedians and performers on how to survive and thrive in today’s competitive artistic climate. Those were the first three sentences in our first email we sent to our mailing list after the third showcase we held at Webster Hall. Based on the feedback we had received from our followers and our overall experience as producers, we came to the conclusion that our partnership with Webster Hall just wasn’t a good fit. The most difficult part about this revelation was that we had told our audience that it was essentially our new home AND we would now be changing the location of our show for the third time in less than six months. After a successful run of two years at Lilly O’Briens, producing a show for Yelp NYC and getting several guest appearances on popular podcasts we were hitting some rather rough speed bumps when it came to securing a new venue. 1. Be optimistic and come up with an action plan! We followed up with our audience to let them know that we understood that they were not happy with Webster Hall as a venue and that we took their views to heart. We also knew that people appreciated our previous location at Lilly O’Briens in downtown Manhattan; a venue that was so random that they felt cool to be in the know about this unique event that took place every month. In the search for a new home, we knew we had to find a venue with owners that would not only be supportive of live comedy but would give us the ability to run the show the way it had always been successful. 2. Keep engaged with your audience! Using our weekly podcast and Twitter account to keep in touch with our following was crucial in making sure they knew about the changes we were making. 3. Don’t be afraid to admit when you made a mistake. We were initially very excited and proud of the opportunity to produce shows at Webster Hall. However after our first two shows, we realized that the venue didn’t quite understand what we were doing with “Comedy Outliers”. Our audience weren’t thrilled with the environment and as producers we found ourselves lost among the many other shows that the venue hosted. The decision to part ways with Webster Hall wasn’t difficult even though we didn’t have a secured new venue at that moment. We had to do what was best for our brand. 4. Be excited about the new changes! Finding a new venue required a lot of emails, phone calls with various managers and hitting the pavement to scope out potential venues. Finding the Wooly was a great success! Not only is it located only a few blocks from our old stomping grounds in downtown Manhattan but the manager is a strong advocate for the performing arts and really gets what “Outliers” is about. In our recent advertisements and promotion we have vigilantly expressed our excite about this “reboot” to our show with the new venue. As a producer, there will be many successes peppered with a few setbacks. You have to be willing to adapt and show your audience that you are humbled by the experience. If they see that you’re doing your best to give them a great experience, they’ll come back and support you! 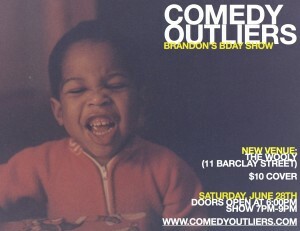 Comedy Outliers’ next show is at The Wooly (11 Barclay Street) on Saturday, June 28th at 7pm. The show has a $10 cover with no drink minimum. Buy $5 advance tickets if you enter code: “BPT”! You can also support their efforts by hitting the “Donate” button on their website. Tags: blogging, comedy, Comedy Outliers, Donate, drinks, hilarious, management, Manhattan, producing, Social Media, Twitter, venues.